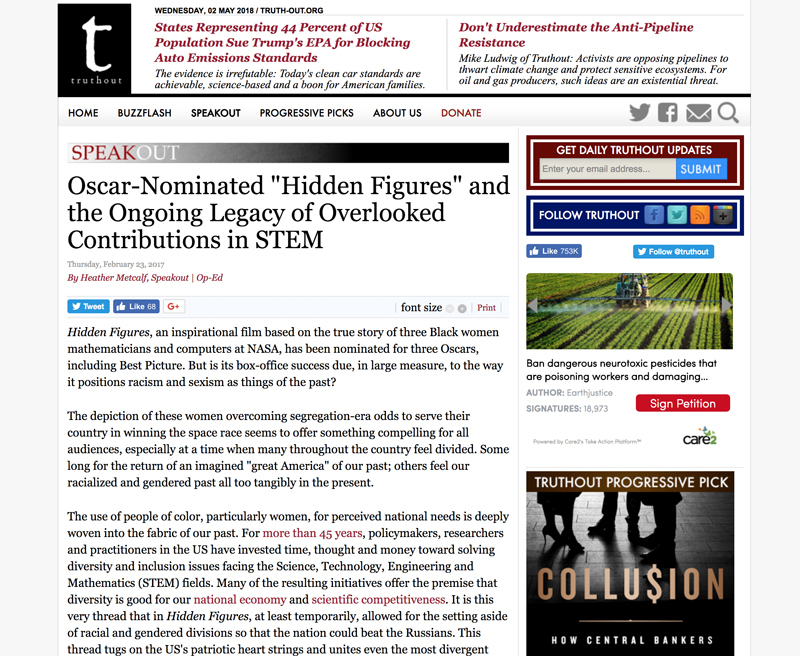 Hidden Figures, an inspirational film based on the true story of three Black women mathematicians and computers at NASA, has been nominated for three Oscars, including Best Picture. But is its box-office success due, in large measure, to the way it positions racism and sexism as things of the past? The depiction of these women overcoming segregation-era odds to serve their country in winning the space race seems to offer something compelling for all audiences, especially at a time when many throughout the country feel divided. Some long for the return of an imagined “great America” of our past; others feel our racialized and gendered past all too tangibly in the present. AWIS endorsed the bipartisan Senate bill recognizing “Hidden Figures” African American mathematicians for contributions during space race. In her article, Dr. Heather Metcalf describes the dangers of not only overlooking the necessity for systemic change in scientific cultures but also disregarding our dark history and ongoing pattern of treating underrepresented groups like resources rather than people worthy of respect and recognition.